Developing trendsetting products for over 20 years, Keith Mullin has developed unique, crave worthy, consumer packaged goods including the award winning Gamer Grub®, a snack formulated for videogame enthusiasts. As a serial entrepreneur, his innovative items in the marketplace also include children’s toys, electronics, and pet products. Mullin has successfully developed products for the undiscovered ‘white space’ within multiple industries. Mullin’s most recent brand, Zippy’s Veggie Bites offer a hearty amount of vegetables and whole foods in crunchy salad snacks. In January of this year, Riverside Capital acquired Bionic®, one of Mullin’s pet brands. Currently, Mullin holds four patents with twelve additional patents pending. Caryn Hartglass: Hello everybody! I’m back. I’m Caryn Hartglass and you’re listening to It’s All About Food. Thank you for joining me. And now we’re going to get to the tastier side of the program. I’m going to be speaking with Keith Mullen who has been developing trendsetting products for over 20 years. He’s developed unique crave-worthy consumer packaged goods including the award winning Gamer Grub, a snack formulated for video game enthusiasts. And as a serial entrepreneur, his innovative items in the marketplace also include children’s toys, electronics, and pet products. Mullen has successfully developed products for the undiscovered “whitespace” within multiple industries and his most recent brand Zippy’s Veggie Bites offer a hearty amount of vegetables, and whole foods in crunchy salad snacks. Welcome to It’s All About Food, Keith. How are you doing today? Keith Mullen: Hi Caryn. Thank you very much for having me here. Glad to be here. Caryn Hartglass: Yeah. Well I’m looking at my salad bites that you sent me, and I want you to tell me a little about them. Keith Mullen: Yeah, so which flavors you’ve got. I believe the Spinach Cranberry Veggie Bites, and also the Lemon Kale Veggie Bites. Keith Mullen: Those are our first 2 flavors that we’ve developed. We’ve additionally are just launching at the produce, the PMA fresh summit next week. We have two flavors. We’ve got Simply Caesar, as well as California Ranch. And both really delicious flavors, and I’m incredibly excited about it. Yeah. So we’ve been working on the project, or I’ve been developing Zippy’s Veggie Bites for almost three years now. Kind of figuring out the… basically getting the taste great, also kind of the technology behind how you can make veggie bites. And you know, you think of an idea, and it always takes three times as long as you think it will but really kind of persistent to say, okay. Well, personally I’m not willing to compromise on kind of inferior products, and I really wanted to be a delicious product that kind of, really kind of achieves the original kind of goal intent that I had when I was, originally had the idea. Caryn Hartglass: Okay. Now, what I do with my nonprofit Responsible Eating and Living and on this program, is I am encouraging people to eat more plants because they’re good for us, and they’re good for the planet. And I always encourage people to go into the kitchen and learn how to make their own food, but we live in a culture where people go for convenience, and people really like their snacks. Caryn Hartglass: And most of the snacks out there have no nutritional value, and probably do more harm than good, loaded with too much fat, too much salt, too much sugar, too much artificial ingredients. So for, well whatever reason for people that like snacking or need, I’m thinking a convenient travel food, a camping food, or something like that, these veggie bites are very interesting. Keith Mullen: Great. Yeah. Thank you. It’s… We found its really difficult a convenient, you know, shelf stable healthy snack, taste, you know, great and fantastic, and I’m sure that’s what’s been challenging for, let’s just say, the general, you know, general consumer type of snacks, you know if you wanted. And also, the cost, you know, let’s just say a bag of Doritos, or Funyuns, you know, the cost and the markup of those projects or products are so just remarkably different than what we’re doing. They’re really kind of profit driven, and driven to you know, keep the cost of the product really low, and then some for high profit, and you know, that’s Frito-Lay, that’s what they do, and you know, driven by shareholders, that’s their business model. We approached it from a different perspective, where we want to make a really high quality product first, and find out how to do that and you know, finding, or I guess, going the cheap route, isn’t really what we’re trying to do. We’re trying to deliver vegetable, plant based-snack item that was delicious, and deliver that to the general consumer. Caryn Hartglass: You know those companies that are making those very popular, empty-calorie snack foods, they have a lot of money behind them, and they have lobbyists behind them, and they also lobby our government or representatives to pass laws, and subsidies that’ll benefit the foods that go into their products. Do you have lobbyists on your team? Keith Mullen: Unfortunately, well fortunately, we don’t. I don’t… Even if I could employ, I wouldn’t. Caryn Hartglass: Are you going to be lobbying for kale; kale and spinach subsidies? 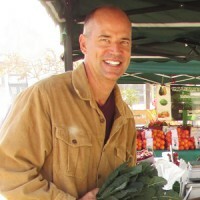 Keith Mullen: I would say, you know, lobbyists that we kind of interact with are really through the Produce Market Association, or through the General Growers United States that we work with to actually get our vegetables. So lobbyists for fresh vegetables and better eating, I would say, are more at the association level, rather than, you know, from our perspective, yes of course we’re not Frito-Lay nor have the operational budget of a large company. We thought it would be better just to build a great tasting product that people enjoy. Caryn Hartglass: Yeah. Absolutely. Well, I look forward to the day when healthy foods get a priority from our government and our schools systems, and from our marketing people so that people are really excited to eat these foods. But this is an interesting step in the right direction. Now, I’ve tried them both and let’s talk about them a little bit. Now, when I bite into the Lemon Kale, it doesn’t happen right away, but almost immediately I get a strong lemony taste, and I imagine that’s from the lemon peel, which not only does it have a very strong and intense flavor but it’s full of flavonoids. Which are good for us. Keith Mullen: Yeah. So, what’s really, I guess interesting to go through and develop Zippy’s Veggie Bites, was that it really kind of has that cascading, kind of taste experience, where you bite into it originally or your first bite, you get kind of a first, kind of favor punch of some of the kale, and some of the spinach, and then as you chew through it, the kind of the lemon notes come up. And on the back notes of this, we added some ginger and then the ginger kind of brightens it up on the back end so you kind of have these three kind of taste experiences as your chewing through the Lemon Kale, and then the Spinach and Cranberry kind of has the same type of, I guess, convoluted you know taste profiles. We’re really trying to achieve much of the same things that you happily you know, taste wise, when you’re having a really good salad. I mean when you’re having a salad, almost each bite is a little bit different, and you get kind of an experience that, for lack of a better term, a symphony of taste, where you’re not really kind of, kind of zoned into this boring, you know, single, you know cheesy puff, cheese. You get many different components of the salad as you’re kind of, you know, snacking on… snacking on Zippy’s. Caryn Hartglass: Right. But I imagine, I don’t know how much market research you’ve done, but I’m still imagining that those who will go for a salty, sweet, oily potato chip or Frito-Lay or something like that, this kind of snack is different for them, and I… I eat kale every day. I love kale. I love spinach. So when I bit into them, I recognized those flavors and I’m good with them. But I think that people who are kind of new to green foods and are want to go for salty and sugar, how do they respond? Have you done some trials with people like that? Keith Mullen: Yeah. Well the product, or the products, we’re just rolling out our products in the marketplace, so we have kind of very limited, I guess, data on kind of how the consumers are kind of reacting as far as in stores. We’ve done extensive consumer surveys, you know developing the product but of course, you know until you get the product in the marketplace it’s, you know it’s your best guess sometimes, you know, with consumer research. But you take a look at the kale chips, there’s many brands on the market that you can choose, and consume, and snack with that are you know, just air dried kale chips that are topically seasoned. You also have seaweed, seaweed snacks, which are also topically seasoned based on a dry leaf, seaweed base. Caryn Hartglass: I love those snacks. I never buy them, I love them. Keith Mullen: Yeah, you know they’re great delicious snacks, and the, I guess, growth in sales, and the growth of that category of leafy green snacks has been growing pretty significantly. Where the difference that Zippy’s has over those, is that they’re using topically seasoned kind of processes, to kind of achieve what they’re doing, which is kind of different than our approach, where were combining different vegetables in a cluster format. So they’re somewhat limited on a taste profile, because you’re taking a base kale leaf, oiling it or watering it, drying it, and then spraying on a season coating, would have… I think they’ve got you know ranch or some other you know chipotle type of seasonings. But it’s a little different in how it’s put together. Caryn Hartglass: Now when I talk about reading a nutrition label, one of the rules of thumb that I tell people to look out for, because people are concerned that processed foods are too salty, is if when you look at the number of calories in a serving, it should be about the same or less for milligrams of sodium. And very often… A serving that’s a hundred calories, the sodium should be around a hundred, and very often in snack foods you see that its double or triple, incredible amounts of sodium. So I’m looking at your product, and actually for snack food they’re pretty good. The lemon-kale with a calories per serving of 150 calories, the sodium’s 170, which is pretty much the same, a tad more but I mean, insignificantly, and the same, pretty much the same for the spinach-cranberry. So these are not high sodium foods. Keith Mullen: Yeah the, the versions that you have are, I guess our latest embodiment of what we’re doing. From even the versions that you have, we’ve been improving upon the formulation and really kind of focusing in on those specific things, the calorie content, you know obviously we got low sugars, but the sodium content, as in the Spinach Cranberry. I mean know that we understand technically of how to do what we’re doing, now we can kind of really zero in and start really pushing I guess the boundary ranges of what we can do on these specific kind of nutritional fact numbers and that, lets just say that the fine sanding on your piece of art, after you figure out, okay here’s the shape, here’s the shape we’re going to make. So there’s still a little bit more R and D to do. Yeah, there’s still a little more development to kind of keep going with this project to make it better and better. Caryn Hartglass: I like that. Now, I’m a vegan, and I don’t eat any animal foods, no dairy and no meat, or fish or anything like that. And when I’m traveling or if I go on a hike or camping there are, there are only certain kinds of food you can have and a go to typical food would be like a gorp with nuts and seeds and raisins, and if I get a little decadent I might add some non-dairy dark chocolate in it. But when you eat some of that it’s really a heavy food with all those nuts and seeds in it when you’re hungry, and I’m thinking this would make a great a snack food for being on the trail or camping or traveling, you’ve got some…let’s see, I’m looking here… It has some sunflower seeds in it, but its vegetables and not heavy in the high fat nut or seed, its peas and soybeans and its pretty good. Keith Mullen: Yeah. We’ve got at least lemon-kale, we’ve got golden raisins, we’ve got whole peas, kale, spinach, organic soybeans, almonds, lemon peel, you know as kind of our vegetable fruit blend, and then over on our spinach and cranberry, we’ve got obviously our nice, quarter-cut, delicious cranberries, peas, spinach, kale, organic soybeans, almonds, of course the sunflower seeds which you mentioned, and we’ve got orange peel as well. So we try to really kind of again deliver what you would experience in a salad, kind of that last spoonful at the very bottom of the bowl…. Keith Mullen: Your like, okay I got to get that… Yeah, exactly, and that’s really, that last bite is always really delicious. Caryn Hartglass: Okay; now I notice your products are not organic, but you do use organic soybeans. Keith Mullen: Yes, we have, that’s another kind of decision, kind of going forward, if we are going to go fully organic I don’t know all the cost. I guess implications on that are right now, we have developed it where we weren’t originally thinking about costs, and continue to do so. At a certain point, it gets a little cost prohibitive, as far as what consumers would pay for an organic food. So we’re working through what we can do with that. We’re definitely of course non-gmo the entire, you know, product line, and either we would start a line as a organic have maybe sister-brand or follow-up products that would be totally organic. Caryn Hartglass: That sounds good to me. Well Keith, thank you for joining me, and thank you for letting me know about your Veggie Bites, and I’ve enjoyed trying them. And so where can people find, or there not out yet they can just go to your website, gozippy’s. Keith Mullen: Yeah the best place to just kind of keep informed of kind of where we will be distributing our products and selling our products going forward would just to you sing in at “gozippys.com”. That’s G-O-Z-I–I-P-P-Y-S .com, and as we kind of build our distribution network and partner with retailers, we will be broadcasting you know to go and find Zippy’s and also we would be selling online as well. Caryn Hartglass: Okay! Well all the best to you. Thank you for joining me on It’s All About Food. Keith Mullen: Thank you Caryn for having me. Thank you I enjoyed being here. Caryn Hartglass: Okay. Take care. That was Keith Mullen of Zippy’s and you can find out more at “gozippys.com”. So we just have a few minutes left, and I wanted to talk about some very special things. Now if you’ve been listening in to this program for a while, you know that last year, early last year, we came out with our very first documentary, which was called, The Lone Vegan: Preaching to the Fire, and it was my story of talking to 250 cattle ranchers about animal agriculture’s impact on climate change. It was really a fascinating experience, and we have that film available for free for you to watch anytime at “responsibleeatingandliving.com”. Great. And I hope you watched it if you haven’t. I know it’s about 60 or 70 minutes long, it take a bit of commitment to sit down and watch. It’s a lot easier to listen to a podcast as you’re walking or jogging or driving or whatever. This requires more senses from you. Anyway, but what I wanted to tell you, and this is really exciting, there’s a website called “cultureunplugged.com”, “cultureunplugged.com”, and they have a film festival, and our documentary, The Lone Vegan: Preaching to the Fire, is part of the film festival. And if you haven’t seen it, or if you have seen it, tell you family and friends to visit “cultureunplugged.com” to watch The Lone Vegan: Preaching to the Fire there and you can rate us, and we would really like to get a good rating and maybe win the prize! Ring the bell and win the prize. And in addition to that there are many wonderful films at “cultureunplugged.com”. So if you’re looking for a lot of educational entertainment, you can spend the next year probably watching films at “cultureunplugged.com, some of them are really, really fabulous and I’m really glad to be a part of it, and delighted to learn about what they are doing. And these are films from all over the world. It’s really lovely to see what people are doing. And even though they haven’t made it to mainstream big screens. And that sometimes can be a good thing. And before I go, I wanted to highlight some of our latest recipes. We went with a Middle Eastern feast last week. And I posted all the great recipes…. You know, there’s something about ethnic cuisines, cuisines from different cultures, I was thinking about this recently, how different areas’ peoples’ have had hundred of years to really fine tune flavors of foods and that’s why they go so well together and I really love Middle Eastern foods with the garlic and the lemon and the parsley and chickpeas and the fava beans and the sesame seeds. All really good. Well one of my really favorite dishes is Ful. Have you ever had Ful the way I like it prepared, is with garlic, lemon and parsley, a little bit of olive oil, not to much. And fava beans have a very unique flavor. There, they kind of have a cheesy flavor almost. I like to say a stinky flavor sometimes, but I love it, I love fava beans, and I put up my Ful recipe at “responsibleeatingandliving.com”. Fava beans with garlic, lemon, and parsley. Mm mm. I wish I had some now but it’s all gone. And while I was making the Ful, we were also quickly preparing a cucumber, tomato, parsley mint salad, and I baked some pita bread, gluten free. And this is another great recipe. It’s not exactly the same as a wheat based pita bread, but they’re round and they’re soft, and you can cut them open and dip your hummus in them. They’re very, very tasty. And then I also added to this mix a lemon chickpea soup. So so simple and very, very flavorful and good for you. So maybe if your looking ideas for a little party, these, the Middle Eastern feast that we have on our website is a really lovely combination of foods to make. What do you think of that? All right so, please visit “cultureunplugged.com”, check out The Lone Vegan: Preaching to the Fire and make some of these recipes. Let me know what you think. You can send me an email at info@realmeals.org. Thank you for joining me today. And remember, have a delicious week.